Croatian employers have until the end of this year to partially comply with the recently enacted Act on the Protection of Whistleblowers (Zakon o zaštiti prijavitelja nepravilnosti; "Whistleblower Protection Act"), with which they must come into full compliance by March 2020. The Whistleblower Protection Act defines who will be deemed a whistleblower and enjoy protection for whistleblowing. In contrast, the current whistleblower provisions are scattered throughout a number of laws, such as the Criminal Code, the Trade Act, the Employment Act and others. Consequently, research conducted in 2017 has shown that around 60 % of Croatian examinees do not know how to report corruption. International taxation is rapidly changing and aligning with recommendations of the Project for the Prevention of Base Erosion and Profit Shifting (BEPS). Cipcic-Bragadin Mesic & Associates has acted for Flixbus CEE South d.o.o. in its acquisition of competitor Auto Poduzece Imotski Ltd.
Marija Zrno has been appointed Partner at CMS Zagreb. Divjak Topic & Bahtijarevic has advised AR Packaging Group AB on its acquisition of all outstanding shares in Istragrafika, d.d., a producer of high-quality folding carton products for the tobacco, food, and consumer goods industries, from Croatia's British American Tobacco subsidiary TDR. Cacic & Partners advised the buyers on the deal. At the EU level, long-term discussions on unfair trading practices in the food supply chain have resulted in the Proposal for a Directive that is currently in process. The Republic of Croatia has already adopted a law with a similar subject matter – the Act on Tackling Unfair Trading Practices in the Food Supply Chain (the “Act”) – which entered into force at the end of 2017. The Act concerns business-to-business relations and aims to protect suppliers (including primary producers) in their relations with resellers, buyers, and processors with significant negotiating power. The authority in charge of implementing the Act is the Croatian Competition Agency (the “Agency”), which the legislator considers the most competent to handle these matters due to its experience in abuse of dominance cases in competition law. Johannes Juranek has been appointed Managing Partner of CMS Reich-Rohrwig Hainz and will assume the role at the start of the firm's financial year on February 1, 2019. Companies in financial difficulties are regularly faced with challenges in seeking fresh financing – an injection necessary for financial consolidation and to overcome financial difficulties. Such challenges become even greater when a company formally enters pre-bankruptcy or bankruptcy proceedings. 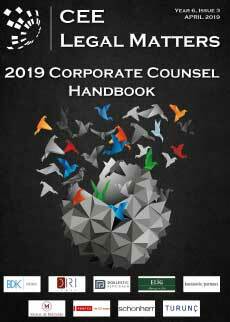 In a large number of cases, the companies are in such difficult and irreversible circumstances that potential creditors are usually discouraged from providing new financing, which is sought by the companies unable to provide any indication of success. However, there are situations in which creditors may be willing to provide fresh capital despite the debtor’s difficult situation – most commonly, because they already have an outstanding exposure against the debtor. Existing creditors considering new financing may see an opportunity to exit the existing creditor-debtor relationship less “harmed.” In such cases, the main questions involve the position the creditors can obtain by granting fresh financing and whether the legislative framework regulating pre-bankruptcy proceedings is sufficiently sensitized to their specific position. Divjak, Topic & Bahtijarevic has advised Prvo Plinarsko Drustvo on its October 31, 2018 investment, made along with Croatia's state-owned oil company INA, into the Capital Increase Agreement of regional fertilizer manufacturer Petrokemija.